I needed a walk but where to go? I didn't want to travel too far, I wanted to gain some height however I didn't want to go to any of the usual suspects in my area, west central Scotland. Somewhere new. Hmmmm. Then it came to me, Tinto! 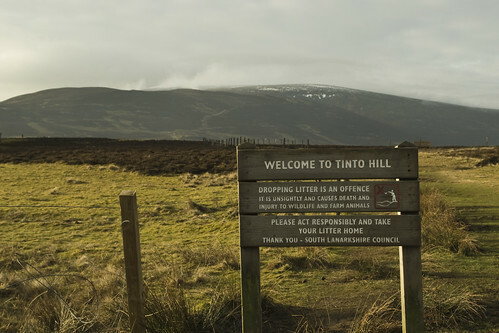 I've lived in East Kilbride for 7 years now and it's somehow taken me this long to get round to Tinto, Tinto hill. It's one of those I keep meaning to do but then I forget about, something else pops into my head and then the thought is gone. I'm off walking somewhere else or doing something else. This time though I was going. I had nothing to stop me and no excuses. The latest OS map was in my hand, courtesay of my good wife. All that was left to do? 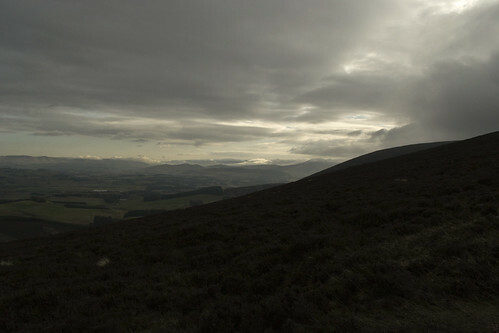 Go see the cairn and stand on the highest hill in Lanarkshire. Down the M74 I bombed, so much so I missed the Douglas road end. My excuse, it looks different travelling north to south than my usual west to east along the A70. It didn't matter much, I took the next exit at the Abington services and worked my way back on the A702 and back onto the A73. After a bit I took the junction for the A72 and Thankerton. For most of this leg I could see the massive hulk of Tinto. I know that it's only 2333ft but because it stands proud and on it's own, it looks massive. There's nothing next to it to dwarf it or to give you a perspective. It's there in the landscape, shouting hello. It was looking good, sprinkled with fresh snow but clear to the top. From the car it looked almost perfect. Finally after the extra miles, I pulled into an empty car park. It was still early not much after 8:15 am. Excellent. The skies were still clear. I got changed behind the car door, retrieved my Alpkit rucksack from the boot and started off up the path. 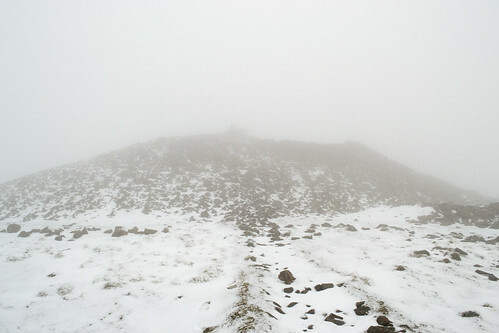 There's a couple of different ways to the top of Tinto and this one is probably the most popular. The path is rather straight up and down according to the map. It's a well used path, probably for a couple of thousand years judging by the width and how it bites into the hillside. It's not hard to believe either, as the cairn at the top has bronze age beginnings. You also have the pleasure of walking in a well preserved hill fort just off the main path on the slopes of Totherin Hill. You can imagine the residents of the fort marching up the path to the cairn to light the fire on Beltane. It's also a favourite of those nutters, the hill runners and apparently paragliders. 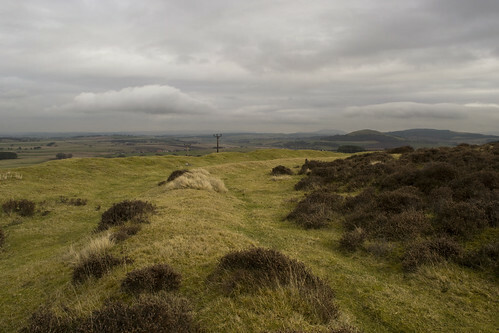 About half a mile from the car park; the Hill fort becomes visible, the large rings and ditches. I spent some time walking round the ditches wondering what it would have looked like. The defences must have been really big as even now at some points I was disappearing from sight in the ditches. I think that there would not be much more than a couple of buildings inside. As the diameter is not more than 60 odd of my strides, across the inner most circle. More a job for the Time Team than my uneducated guesses. I got my contemplative self back on the path and started on the first hurdle. Up and over Totherin Hill. It's a nice lung buster for this little unfit walker to stretch his legs on. I made steady but slow progress. Not that it mattered. I was walking with myself and having fun. I stopped often; to take photographs, not catch my breath. If you hear anything to contrary, lies. It was windy but fresh but not that I needed any extra layers on when I was walking. I had built up a good head of steam. The views that I was afforded to the south and west were great. I could see far down the rest of the Southern Uplands into Galloway and Ayrshire. 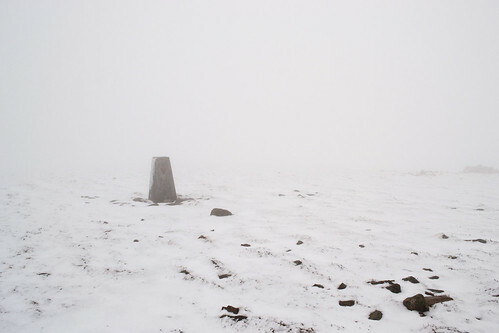 I could even make out the Kames at Muirkirk and it's flat table top summit. Beautiful. Even although there was still no sign of spring. The heather still brown and sleeping, waiting for a warmer sun and less frost. Tinto's tap had been hidden for a while and as I got over the top of Totherin Hill, I was surprised to see some really heavy looking clouds had blown in. Angry looking fuckers with menace attached also know as snow carriers. You know the type. Not what I was expecting it but not unexpected. It's Scotland in February. 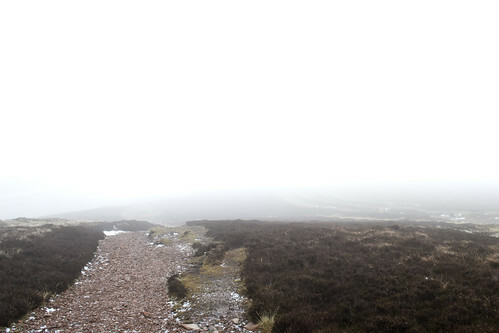 As a reached Maurice's Cleuch and started to climb upwards again the cloud started to drop the white stuff. Nothing drastic, a powdering like it was covering a cake in icing sugar. The visibility was getting shorter with every step but not to a degree that was I going to worry and especially not on this hill. I always find that when the clouds close in around and envelope you an eerie quiet descends with them. Very peaceful except for the crunch my foot falls on the gravel and the clink of the tungsten tips of my walking poles. It changes your perspective and distances expand as your vision shortens. The path was getting harder to pick out with fresh snow falling even although it was light. It was adding to what was already there. I was having to look hard for the depression in the ground that indicated where the track was. I just took my time and every now and then I would see a frozen foot print in the snow. Visibility was down to less than twenty feet by now. At that point the fence appeared that isn't shown on the map. It would lead me to the summit. That made things very easy, I just had to keep the fence on my right and it would take me all the way. Enjoying the solitude and the quietness. Just me, my thoughts and the hill. Enjoying the placing of one foot in front of the other. Making my way slowly to the top. Completely absorbed in my little world. Until...... SQUAWK! I disturbed a grouse. I jumped out my skin with the sound of it's unholy scared calling. The bird took flight. Frantic flapping. Disappearing into the cloud and snow. Not sure who got the bigger shock but I'm certain it's final call as it vanished was calling me a tnuk. Sounded very much like it. A bastarding grouse! I'm jumping about like one of those blood thirsty pterodactyls from the land that time forgot was about to swoop down and carry me to my doom. I had a word with myself, popped my heart back in my mouth and got on with following the fence. Luckily I was walking solo. 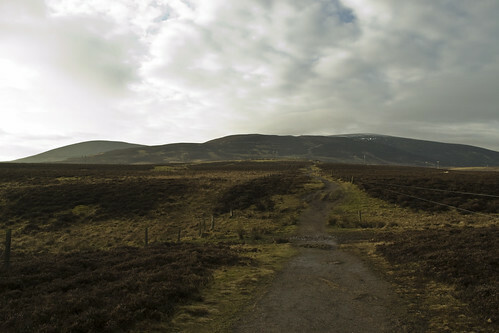 I was beginning to feel like I was walking to the ends of the earth, that I should be on the cairn by now. I was even tempted to dig the map out but I knew it was my mind playing tricks in the cloud. Not sure what I was going to take a reading from, there was nothing to get a bearing off. I suppose I could have juiced the battery on my iPhone if I really needed to but then that's dependant on a signal. I knew hadn't walked nearly as far as I had sensed. Plus the fence hadn't changed direction yet, it's not marked on the map but it takes an angled turn when it reaches the cairn and the trig pillar. Shaking the clouds from between my ears I continued on. 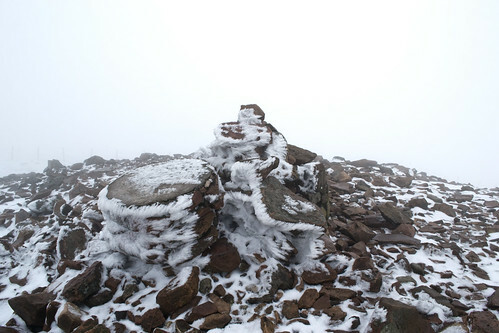 All of a sudden out of the gloomy clouds appeared THE cairn. I've seen some big cairns in my life but nothing like this. It's massive. There at that moment in that weather it just towered above me. Not that that's hard and here was me, minutes earlier thinking that I could have walked by it. I never measured it but the cairn is six metres high and about forty metres across and that's how it stands just now with the top loped off it. Would be interesting to see in all it's glory before it collaspsed and some folk building wind breaks from the stones. I was a bit exposed to the elements standing on the top. Techinically the highest point but not really, the trig pillar was off to my left and a little hidden in the clouds. I sclimbed down and louped the dyke, walked over and touched the trig point. Done. Summit reached. Not that I was bagging the summit. I just have the urge to always touch the pillar like I do with cairns. I just have to physically touch them and connect to them. I suppose it's my little ritual. 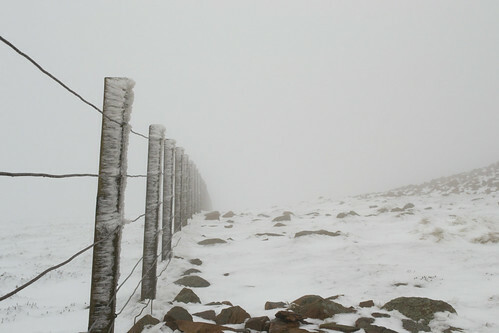 I jumped back over the fence and hunkered down in the lee of the large summit, out of reach of the wind and whispy blowing snow. Brew time. A Lion Bar and a cup of tea. Out came my Pocket Rocket, behave! Stop the sniggering at the back there. Yes that means you. I got it fired up, poured water into my Halulite Mininalist pot and got it on for the boil. The Lion bar was solid, like I had left chocolate in the fridge over night. I wasn't expecting that. I got as comfy as I could. The water boiled in no time at all. Hoping that the wind would carry the clouds away and that I would at least get a break so I could snap some photographs of the view. Dunking your Lion bar in your tea makes for an interesting cuppa but it certainly softened the bar. I gave up. The cloud wasn't for clearing anytime soon and I could see ice was starting to form on the Gourdon where the sweat collected on the backpack. I gathered my gear back together which is to say I tidied up my stove and the pot. I started to follow the fence and my fresh tracks back down. It wasn't long till I was scaring the grouse again. This time I was ready for the blood thirsty pterodactyl. No fright this time. After that I was out the cloud and looking down on to Totherin Hill again and I could see the views again. Much to my surprise I could see two people making their way up. I past the two, a man and women. We spoke, just a short conversation. Pleasantries. Me passing on the summit conditions. I had not long left the couple when I spotted another next walker. In fact it was probably only a couple of minutes. An old guy out for a walk. Hopefully I'll still be fit enough at his age to be tackling nice strenuous walks like this. It was starting to get busy. After him it was like a slow procession; a guy, 2 guys, a guy with 2 dugs, guy with a big Clydesdale cuddy o' a dug. A great Dane I think, It wasn't shaggy like a Lurcher but smooth like a Setter. I'm not up on big breeds of dug. Whatever it was; it could probably bring down a deer, the way it was loupin' aroon the dormant heather. It didn't have a leash, it has reigns. FFS. It could definitely pull a plough. It was big enough to walk up to me a gie my dish a lickin' without standing on it's hind legs. If it did that it would be taller than me. Easy. Then I was back at the Fort heading to the car park thinking that it was going to be a busy lunchtime on the tap of Tinto. On Tintock tap, there is a mist, and in that mist, there is a kist, and in that kist, there is a cup, and in that cup, there is a drap. Tak' up that cup, and drink that drap, that's in yon kist, on Tintock tap. Expect there was none of that but I still had a good time.